Today's topic may be a little "woo" or out there for those of you who aren't familiar with intuition, but I will keep it simple and to the point. Intuition is "your gut", "your conscious", "your inner voice", or any other phrase you may have heard used to describe your instinct. You may call it something else, but one thing rings true: learning to listen to (and trust) your intuition is vital on the journey to mental well-being. Steve Jobs called intuition “more powerful than intellect" and Albert Einstein called intuition the "sacred gift." Some of the most well known discoveries, relationships, and ideas are born from instinct that comes from intuition. 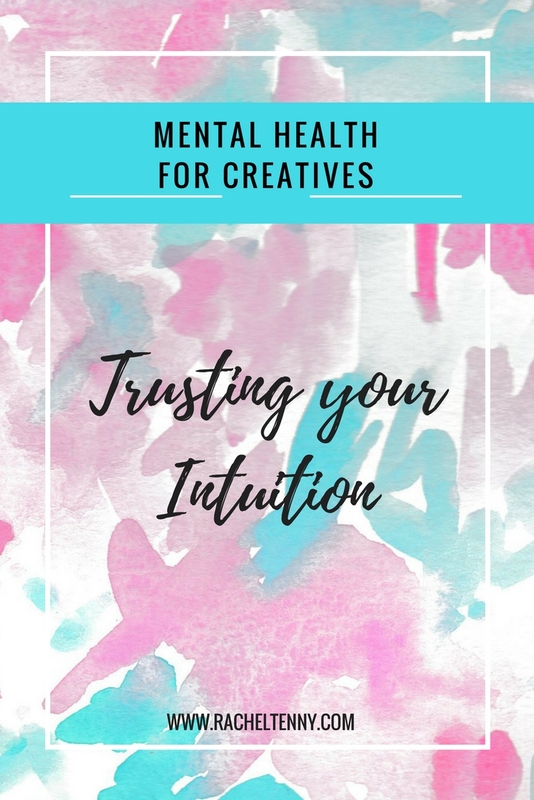 Trusting your intuition is a psychological phenomenon that has been happening for hundreds and thousands of years, but was first discussed and written about by Carl Jung. Trusting your intuition is something we are born doing, but over time we begin to doubt and questions ourselves. Trusting intuition is what kept our ancestors alive through various dangerous scenarios and predators. Like anything else intuition can dissipate if it isn't used. You may have heard people say "go with you gut", or "you will know when it's right" when having to make hard or complex decisions. I like to believe that our intuition guides our decision making if we don't overanalyze situations and go with our initial instinct. An example that immediately comes to mind for me is taking tests in high school. You circle the answer that feels most correct, but then upon checking your answers you change it. Later when you get your test back you notice that the answer you had originally selected was the correct one. Life, like tests, doesn't always have one clear answer.....there are often various choices that can be rationalized, but using your intuition can help you make the decision that's the best fit for you. That is the entire point of our intuition, to know what is the BEST decision for US...not for anyone else. When you have an intense gut response that something is right or wrong, go with it. Trust yourself enough to listen to that voice without questioning it. There are many things that I have found that are distracting from intuition, with the biggest of them being self-doubt. As self doubt and insecurity increases the volume of our intuition decreases. When you ignore your intuition, over time, it can be harder to hear. Each time you listen to yourself and your intuition, it builds a higher level of self-confidence and trust. 1) What keeps you from listening to your intuition? 2) In what areas do you struggle to trust yourself? 3) What are you afraid will happen if you "go with your gut"? 4) What is a time you've listened to your intuition previously and it went well? 5) What is a time you've ignored your intuition previously and it went poorly? Listen to your body and the cues you get from your intuition. Our bodies and mind are designed to keep us alive. Notice your emotions and sensations you have throughout the day, especially when you have feelings about what is wrong or right for you. If you are someone who has gone through life so far without much thought to the role your intuition plays, begin to pay attention. Stop to notice what changes as you listen to you inner voice. As you begin to make decisions with confidence, it will reinforce your trust in yourself! Be sure to join the FREE Facebook Community and continue the discussion there! What other struggles are you currently battling with as you navigate your small business journey? I would love to help! Feel free to email me (rachel@racheltenny.com) with any questions you may have or topics you would like to see covered in future posts.